During construction of all our new homes we install engineered stair stringers instead of traditional solid lumber stringers. The engineered stair stringers we install provide a stronger and more durable stair system. The engineered stringers do not warp or bow overtime like solid lumber does. This eliminates any potential of the stair system bouncing or squeaking when walked upon. Andersen has been providing home owners with quality windows for over a century, and creating a beautiful view from both in and outside the house. During the construction of all our new homes we prefer to use Andersen Windows because of the quality of the product and the design options given to the owner. Given these two traits home owners receives a better built home with Andersen Windows. Andersen provides a large array of window options from materials, styles, and color options. With all these variables any window design can be met to match the style of the house the home owner is looking for. Andersen windows are manufactured with wood, vinyl, and composite materials which provides a strong study window. Being made out of these materials, the windows resist decay, and are low maintenance for the home owners. Andersen offers a variety of glass options to match any climate and owners desires. Low E Passive-Sun Glass: Allows the suns heat to transfer through the glass. Heat-Lock Coating: Prevents heat from exiting the home through the glass. Triple Pain Glass: Most energy efficient window option. Behind all of our masonry veneer finishes we install drainage mats which are used to drain water and protect the masonry veneer finish. Masonry veneer finishes without a drainage mat allows water to accumulate between the veneer finish and the wall sheathing. Water in this area can lead to cracking and chipping of the grout, and overtime lead to further issues with the masonry veneer finish. In all our new homes we build, we start construction with nine foot basement walls, followed by nine foot house walls. We increase the wall heights, from standard eight foot wall construction, to increase the space in the home which creates a more open feeling. Raising the ceiling heights in a home creates a more comfortable living condition for everyone in the home. Increased ceiling heights also allows for customizable window locations and larger windows, which increases the natural light in the home. 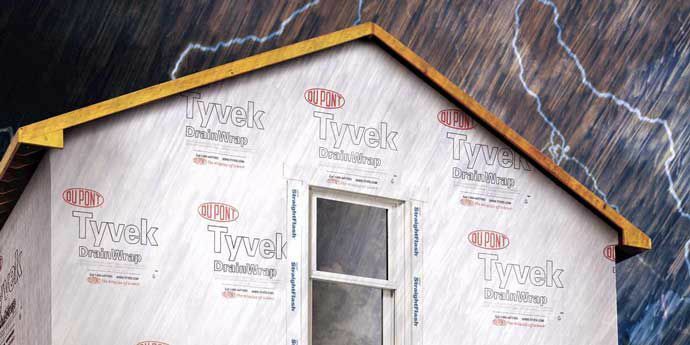 During exterior wall sheathing with oriented strand board we wrap our houses with Tyvek drainwrap rather than standard house wrap. Standard house wrap allows water to rest on the house wrap and slowly drains away. Tyvek drainwrap has vertical groves which gathers water and quickly drains the water to the outside of the house. During the final steps of the construction process we use Fortress Floors if the home owners decides to finish the garage flooring. Fortress Floors uses a polyurea base with a polyaspartic top coat which is far more durable than a common epoxy floor finish. Fortress Floors chip flooring is finalized with a textured finish which provides traction when foot traffic and vehicles are moving on the floor. Also, the textured finish on the floors will not become slippery when the floor gets wet. Dirt, oils, and other contaminates cannot penetrate the surface of the finished floor, which makes for easy cleaning and no concern for stains from engine drips. Fortress Floors is backed with a 15 year warranty on all the floors they install. At Rautmann Custom Homes, we are always searching for a better way to do things. When it comes to our floor systems, that philosophical approach results in the use of AdvanTech floor sheathing. Not only do we specify a stronger floor system than code requires, but the use of Advantech provides our homeowners with additional strength, superior weather resistance, and a much more stable surface for all of your beautiful finishing touches. AdvanTech’s floor sheathing product is stronger and stiffer then oriented strand board and plywood. This floor sheathing product eliminates any movement of the floor due to its stiffness, and holding power. In result the floor will not squeak, shake, or bounce and can support greater loads. AdvanTech's flooring system resists water from entering the material, which in return will prevent any swelling and cupping from any precipitation or home water leaks. AdvanTech's floor system is backed with the best sub-floor warranty, the warranty can also be transferred to future home owners. At Rautmann Custom Homes, we believe in Building Better Homes. A home built to code requirements is the worst home you are legally allowed to build and inhabit. We strive for something more, and through the use of Better Craftsmanship, Materials, Methods, and Craftsman we provide a Better Experience and Better Home. Contact us today to find out how you can #BuildBetter.